I saw a recommendation for a later book in this series and thought I'd start with the first one. I'm always looking for new beginning chapter series that will be popular but are something a little different. This is Nicola Davies' first fiction series, all her other titles being nonfiction or poetry. It includes a lot of the things that Davies feels strongly about; animal rights, urbanization, and getting kids to have hands on experience and care about the world around them. Gemma, Meera, and Karl love animals and can think of nothing better than having their own farm. There's just one problem; they all live in small apartments in the city. Then they hear about an abandoned train station that sounds perfect, and it's great timing since Karl's aunt accidentally buys a couple sheep. Suddenly animals are showing up left and right and everything is falling into place. But then the city council tells the children that they're planning to tear down the station and build a new car park. Will they have to give up their farm? I really liked that Davies included a variety of characters without making a big deal out of it, or creating one of those girl group series where it seems like they're trying to bring to life one of those "dolls of all nations" sets. These are just kids who like animals and are friends. The story is pretty much pure wish fulfillment from beginning to end, but it's no less enjoyable for that. The kids just happen to have the requisite knowledge to care for the different animals they collect, there just happens to be a local news source that wants to promote their story, the whole city backs them up in creating a city farm, and the stereotypically evil city councilors immediately back down. At the end of the story, a farm manager shows up out of the blue - and informs them that she doesn't need to be paid. Verdict: Not every story has to be realistic, and kids who love animals will revel in the joyful fantasy of having their own farm. The story is funny and only devolves into didactism in a couple places. As a debut beginning chapter book it's quite passable. 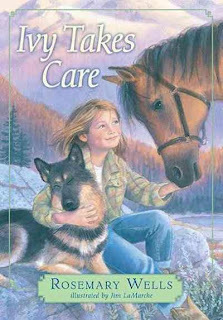 If you already have the standard animal lovers' beginning chapter books (Daisy Dawson, Lulu, Down Girl and Sit, and Sophie) and need more in this genre, this is one worth considering. 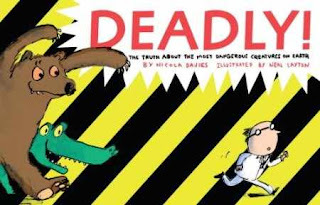 This little book with its quirky facts and humorous illustrations joins a series of nonfiction collaborations between Nicola Davies and Neal Layton. Previous titles include Poop, Extreme Animals, What's Eating You and Just the right size. This book tackles deadly and dangerous animals. Not just big predators like sharks and bears, but smaller bugs and other animals. The book begins with a chart of the animals that will be covered and their danger factors, then moves on to more details. There are big cats, dogs and wolves, sharks, crocodiles, a variety of undersea creatures, winged predators, snakes, and a selection of bugs and insects. Some are deadly to humans, some only to other animals. The final chapters discuss how humans live - or die - with deadly predators, from milking snakes of their venom to the destruction of sharks worldwide. The book also includes an index and glossary. Davies' writing style in this book is a perfect match for Neal Layton's gory caricatures. The book talks honestly but in a humorous way about the dangers of these animals and how, despite their deadly abilities, they are often at risk from humans or misunderstood. There are pictures of a crocodile ripping apart a zebra, exploding ants, shocking electric eels, and more. Verdict: This will appeal both to kids who like weird and gross facts and to those who like serious nonfiction. While my preference is for photographs in nonfiction, the pictures in this book do suit the writing style and will attract kids who want something that looks funny as well as informative. Staff meeting on Monday and general craziness the rest of the time. We're swinging into the final stretch and time has seemingly stopped. Of course, the crazy business of summer has not prevented me from starting plans for the fall! I'm trying to focus on the positive, but it's been a very frustrating couple of weeks. Fortunately, I have a lovely storage area/puppet theater in my Storyroom with thick curtains that muffle the screams nicely. Friday was much more peaceful than I had expected - fortunately (for me, if for no one else) it poured rain and I didn't have to do a program at the town's summer festival, we just hung out in the Storyroom instead. I did have to fiddle with the urinal, but no bodily functions were actually involved, so it could have been worse. Saturday was...well, Saturday. Crazy. How can I think with all this crazy going on? To relieve the tension, I give you Funny Things Kids Say and also cute pictures. Summer reading is still too easy - we need to add lasers! Kid 1: "I've read more than 14 hours already, I've finished the whole super reader log!" Me: "We should have another program, huh? What comes after you're a super reader?" Why did somebody break it? I don't know. You should fix it. I generally don't review sequels, but I picked this one up without realizing it was the third in a series and it seems to stand well enough on its own. The general premise of the series seems to be that there's magic in the ground under and around the house of the four willow kids, Abner, Tate, Celia and Derek. In the two previous stories, the magic involved hamsters and lawn mowers. In this story, obviously, it's all about grasshoppers. Abner accidentally finds himself signed up to be a major part of the town's historical parade and he isn't looking forward to it at all, especially having to read a speech in front of a lot of people. His siblings decide the best way for him to conquer his fear is by testing his bravery and it just so happens they have the perfect thing for him to try...roasted grasshoppers! Unfortunately, they all temporarily forget about the magic underground...and that grasshoppers start out as underground larva! A lot of crunching later, Abner and Tate has some serious hopping ability. It's all fun and games until they realize someone else might be affected too. 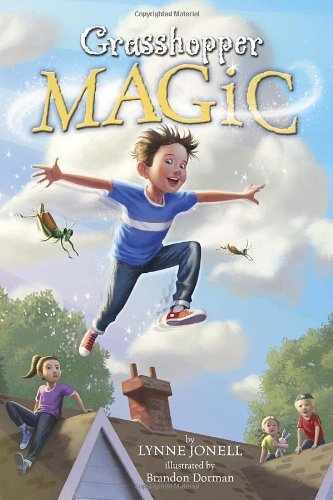 Abner gets a chance to realize he really is brave when it matters, whether it be saving a baby or ignoring the taunts of other kids, and they all have some wild, high-jumping experiences. At 100 pages, this is an easy, friendly fantasy for kids ready for longer chapters. It's not perfect - the whole thing wraps up way too neatly, there are a lot of random plot ends that could have been cleaned up, and there are too many kids for any of them to really develop as characters, but it's a light, fun fantasy that kids will zip through and enjoy. An additional purchase. This book is strongly in the "and THEN" genre of child-like storytelling. It's weird, hilarious, and pointless. A certain subsection of 2nd and 3rd graders will love it. So, Andy and his friend Terry live in a 13-story treehouse. 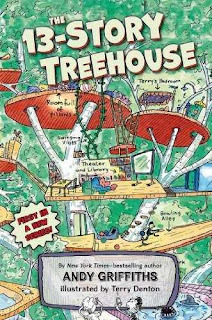 A glorious diagram of said treehouse fills the endpages, showing exactly where the unique features of the room from giant catapult to secret underground laboratory. Besides being their home, the treehouse is also where they write books. They've written a whole stack of them (a close observe some familiar titles). Sometimes they make up their books, but sometimes they just write down what happened and that's where this book comes from. It all starts with the canary-cat, or catnary. Then their publisher, Mr. Big Nose, calls. He is a little upset that their latest book is a tad late and they set out to write it immediately...as soon as they deal with the sea monkeys. But then they find themselves facing down a sea monster, attacked by a giant gorilla, blowing burp-filled bubblegum bubbles and...will they ever get the book written? The illustrations are pen and ink scribbles, just the kind of thing a kid would doodle all over a book as t hey write crazy adventures with a friend. The pictures - and the stories - are cheerfully inappropriate, ranging from the main characters kissing a mermaid (and the grossness resulting) to the drawing of super finger, complete with bare bone sticking out the end. Verdict: Fans of Griffiths' easy readers (The Big Fat Cow that went Kapow is a favorite at our library), Captain Underpants, or Zombiekins will be delighted by the mixture of gross, nonsense, and total randomness dumped into this book. The reading level varies throughout the book, but a good 2nd or 3rd grade reader should enjoy it. Do not hand to stuffy people, those without a sense of humor, or anyone who hasn't recently had an uncensored talk with a 3rd grader. A lot of talk about this new nonfiction graphic novel is going around, so I borrowed it from another library. Being the independent (i.e. cranky and opinionated) reviewer that I am, I can see that it's intriguing but I also see some issues with the story. 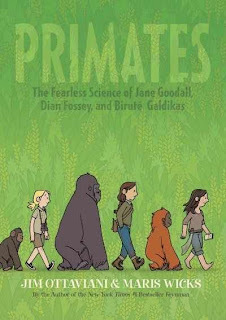 This is a combined narrative of three women who studied primates. It begins with Jane Goodall, who loved animals and, after meeting Louis Leakey, suddenly found herself studying chimpanzees. The story then segues into the similar life of Dian Fossey and her study of gorillas. Finally, it introduces Birute Galdikas and her life with the orangutans. The story concludes with some thoughtful reflections on where each woman is now and how her research changed her life; Galdikas eventually separated from her husband and married a local man who understood that she would not be leaving the jungle. Dian Fossey lived a difficult and controversial life and it ended tragically. Jane Goodall managed to combine both worlds and transition from her research to become a public figure, speaking out to save chimpanzees. An afterword talks about the difference between fact and fiction, and how the authors blended both to write a narrative about the three women. A bibliography of resources on all three women and related articles and books is included. The illustrations reminded me of Lucy Knisley's neat, tidy lines and soft colors. The story is laid out in neatly organized small panels and there's an oddly clean look to everything, even when the women are sifting dung or covered in mud. This is certainly a great introduction to the complicated lives of three important women. It hints delicately at the controversies and issues surrounding them, from Leakey's penchant for young, single women and his weird ideas about research, to the lack of scientific credentials and their sometimes rocky personal and public relationships. 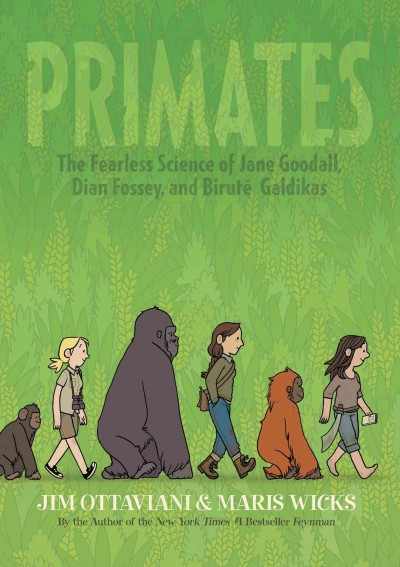 It talks honestly about the differences between the initially romantic view of Goodall and Fossey and the harsh realities of research alone in the jungle and trying to move between two worlds. I found the blending of the three stories somewhat confusing. Although the three women are drawn differently, it was hard to tell sometimes when they had moved from one to another, especially when they were younger. Mainly, however, I wonder who the audience for this book really is. The art has a friendly, uncomplicated feel with a light comic touch and just looking at the pictures I'd expect it to be for a much younger audience. However, the story itself touches on more adult themes (the women's relationship with Leakey and others, Fossey's death, etc.). Then again, these situations are all very glossed over, sometimes so much that you can't even tell what they're hinting at, which was annoying. Verdict: Although I'm not sure of the audience for this (and nonfiction graphic novels don't do well at my library) and I did find some of it confusing, it really is a good introduction to three influential women and the art is very attractive. I'd probably put it in teen and see what happens. This week at the library; or, Book Sale week! It's all downhill from here. Monday went by in a swirl (heh heh) of toilet plunging, minor catastrophes, and general Mondayishness. We had an awesome group for Duke Otherwise on Tuesday and he was a great performer, very fun, friendly, and connected wonderfully with the kids, I hope we'll have him back again for future Storywagons. We had 82 kids and parents (for our town that means about 60 kids and 20 adults btw) which is a really good number for a performer we haven't had before. Then we had an "accident" in the children's area, a chat with a patron reminded me that I need to turn in a local grant request NOW, I found out Pattie will be out of town and I've got 3 storytimes to cover in two weeks and our director brought back news of a particularly....exciting city council meeting. I am thinking I better recreate my resume and references (lost when my computer crashed) now rather than later. Wednesday. Had a good group for storytime, too hot to think or really do anything though. So. Hot. Thursday. Starting with the little girl who cut her hand on the youth services desk (whatever idiot thought sharp corners on the children's desk was a good idea? ), continuing with a whole mess surrounding the community room (it's in the library, but booked through parks and recreation and a whole bunch of other stuff involved with that is going on) and then standing outside in the sun for Messy Art Club. I ended about 15 minutes early b/c everybody had left. Friday. I repeated the same thing for We Explore that I did for Messy Art Club. Fortunately, it was a little cooler. Not much, but a little. Friday's catastrophe was the appearance of huge, sopping wet stains on the children's area carpet. They are a total mystery. They are HUGE, several feet in diameter and soaking wet. We are baffled. I thought this was going to be another one of those saccharine mommy (or in this case daddy) love books and avoided it for some time. I should have realized that Robin Pulver's conventional but cheery stories and Alley's endearing pen and ink style would not let me down. Mimi loves her special days with her dad. Every Saturday is Dadurday and together they plan wonderful adventures, from making pancakes to going to the library. But what will happen to Dadurday when Dad's work schedule changes? Pulver and Alley have created a story that's sweet without being saccharine. Kids and parents will easily recognize their own feelings of disappointment and frustration when things don't work out. I loved that the author portrayed so clearly a child's devastation when a tradition that they've come to expect ends and the frustration with grown-up concerns that don't make sense in their world. There's no happily-ever-after where Dad's schedule gets changed back and everything comes right, but Mimi manages her own happy ending, growing up a little as she learns to be flexible and see things from another perspective. There's plenty of solid cheeriness in Alley's illustrations showing the mischievous dog, tired Dad, and exhausted Mom, not to mention the twins, but the real genius of the pictures is the simple delight the reader sees in the bond between father and daughter as they celebrate Dadurday together in many different ways. 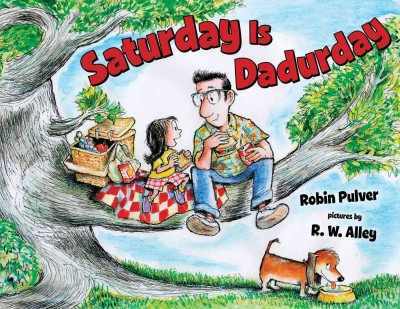 Verdict: Of course this will be a popular choice around Father's Day, but it makes a sweet father-daughter read any time of the year. The best storytime audience will need to be a little older, say kindergarten to pick up all the details of the story and empathize with Mimi's feelings and actions. 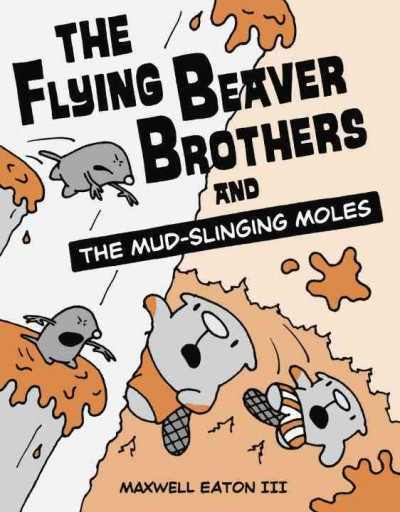 Since I got a galley that included both of the next Flying Beaver Brothers books, I'm going to do a double review today. I loved the first Flying Beaver Brother books and I'm SO EXCITED to see more. First, volume 3, Mud-Slinging Moles! I had to admit, I was a little disappointed by this volume. Ace and Bub are just hanging out on their island when suddenly giant gloppy sink holes start appearing and things begin sinking! They make a journey to see the all-knowing, wise marmot, but he's not much help. Fortunately, they wind up discovering the culprits - confused and confusing moles - and also realize they need to work together as brothers to get things done. There's nothing wrong with the story, it's just...bland. I'm not sure orange was the best color scheme for the mud-themed adventure and it's not as well laid out as previous stories, so it's kind of confusing. Just kind of meh. 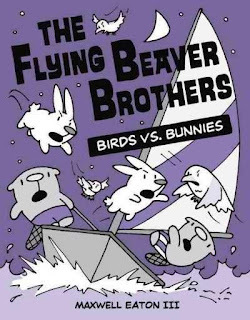 Now the fourth volume, Birds vs. Bunnies, is awesome. Like the first two stories, it's unique and funny. Although the plot of this volume isn't as original as the others, Eaton gives it a fresh spin and his own tongue-in-cheek humor and I giggled my way through with joy. Bub and Ace think life is great and spending a week on Little Beaver Island relaxing will make it even better. But when they get there, they discover the birds and bunnies are in the middle of a rapidly escalating fight. Are they just too different to ever get along, or is there a mysterious person amping up the tensions? Several giant mechanical contrivances, a lot of confusion, and one mysterious mastermind later, Bub and Ace have reunited the birds and bunnies and everything is peaceful once more...maybe. This series is turning quite rainbow-hued and this fourth volume goes all out in the purple department. Although the basic plot isn't particularly unique, it's the clever details and deadpan humor that sets it apart and makes this a hilarious read for kids and grown-ups alike. You wouldn't think it was possible to get subtleties of expression in the thick lines and blunt art of Eaton's style, but it's amazing how much he can express with just a turn of the head and a few panels. Verdict: While the Mud Slinging Moles was a bit disappointing, Birds vs. Bunnies more than makes up for it and you'll want to collect the whole series. It's a great beginning chapter book series for emergent and beginning readers with it's simple art and text, but the subtle humor will make older kids and even adults enjoy reading these over and over again and giggling every time. A great addition to the solid color, small format graphic line that includes Babymouse, Lunch Lady, Squish, and B. C. Mambo. This looked really interesting when I glanced through it at ALA Midwinter last January and I got tired of waiting for someone to buy it so I could read it, so I went ahead and purchased it for our library. I'm a little disappointed, as it didn't turn out to be as unique (or interesting) as I had hoped, but it's still a good read. The brief introduction talks a little about how we see women and how we decide who's "bad". Did they commit crimes or were they just strong women in a time that was viewed as wrong? What was the context of their actions? 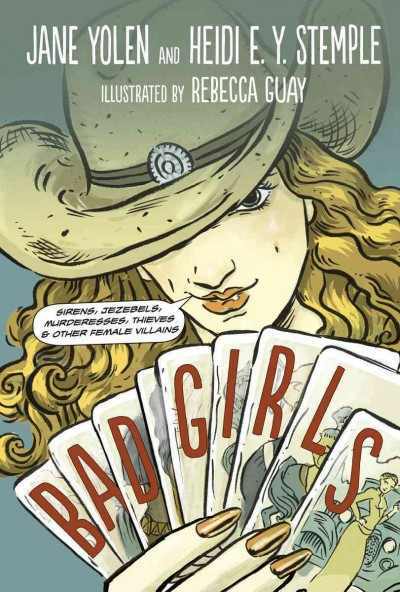 It ends with a one-page comic introducing the authors, Jane Yolen and her daughter Heidi, and a little dialogue about their opinions on the women ensues. Each chapter features a different woman, telling her story in two or three pages. The chapters open with a stunning painting by Rebecca Guay and end in a comic showing the two authors discussing the personage (as well as cooking, shopping, or just chatting together). The stories begin with Biblical characters, Delilah and Jezebel, then moves on to Cleopatra, Salome, and other well-known "bad girls" including Anne Boleyn, Bloody Mary, Elisabeth Bathory, Moll Cutpurse, Tituba, Anne Bonney and Mary Read, Peggy Shippen Arnold, Catherine the Great, Rose O'Neal Greenhow (Rebel Rose), Belle Starr, Calamity Jane, Lizzie Borden, Madame Alexe Popova, Pearl Hart, Typhoid Mary, Mata Hari, Ma Barker, Beulah Annan and Belva Gaertner, Bonnie Parker (of Bonnie and Clyde fame) and Virginia Hill. The book ends with a conclusion, discussing "modern times and changing gender roles" and encourages readers to decide for themselves about the women featured in the book. There's a bibliography divided into resources for each woman and an index. The stories of the women are written in a conversational, speculative style. Did they really do those things? Is that what they thought/said/felt? You decide. It wasn't to my taste - I like my straight-forward history, but it will probably pull more kids in to read this, as will the short chapters and art. My main disappointments were that all the women featured were pretty old hat, the same people you'd automatically think of when talking about history's bad girls. As the stories moved to the modern day, they were pretty much all American as well. 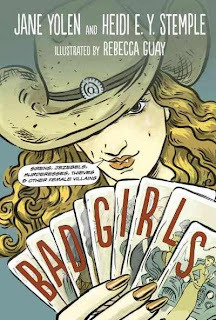 I was hoping for a more diverse grouping and I was familiar with all of them already except a couple of the modern gangster girls and Madame Popova. I also found the comic sections a bit bland - they're mostly just talking heads or swirling skirts, showing Yolen and Stemple chatting as they hang out together. Audience is tricky on this one. There's a few mild references in the stories that might make this inappropriate for really picky parents or younger kids, but the narrative style doesn't seem like it would attract teens (who don't read much nonfiction in my library anyways). I decided to put this in my juvenile nonfiction, since generally speaking I've found parents are a little more relaxed about "content" if it's historical and I think this would be perfectly appropriate for most middle school readers, and probably down to age 9 depending on the child. Verdict: I prefer Goosebottom's collections of Dastardly Dames and Real Princesses for learning about a wider variety of historical women, but this was an interesting browsing collection and I think the art will attract readers. An optional purchase if you think there's an audience in your library. Finally got all the pictures up for the Stuffed Animal Sleepover. Tuesday, another very, very busy day. The Storywagon was awesome and I definitely plan to hire them again on my own. I'm feeling kind of frustrated that I didn't get all my summer programs planned ahead of time like I was trying to do back in May. I didn't finish planning and preparing Wednesday morning's storytime until...Wednesday morning. But there simply aren't enough hours in the day and with all the issues and emergencies and unexpected drama of the spring, I simply didn't have time. So, flying by the seat of my pants here. Not my favorite thing, but at least I have enough of a backlog of storytimes that I am not planning them from scratch. My director was going to supervise YA Gaming, since her office is across from the teen room, but she had a meeting come up at the last minute, so I had to race up and down the stairs for the first couple hours until she got back. Not that many kids actually came, but the less supervision the more misbehavior there will be...last time I actually worked on stuff in the teen room for a lot of the afternoon, but I wasn't able to do that this time b/c everything I needed to do was downstairs. Of course, adults complained that the kids were too noisy, yet another reason why our teen area is badly situated, although some of the complaints were just.... Anyways, I will probably not do gaming again in this room, much as I would like to. I am feeling really frustrated. Everything I tried to do something else came up and derailed it. Realized we were running out of 1,000 Books Before Kindergarten folders, discovered I was out of the labels that have to be sent out to a printer (or so I think, the way this week is going they will suddenly show up again somewhere). One of my aides was sick and I am still training the other, which is stressful for both of us as we figure out what we're doing, so not having a second person there to take care of the rapidly accumulated shelving...something I had planned for Friday fell through and I had to run around and plan something else. Suddenly realized I did my math incorrectly and we were going to be short of summer reading prizes soon so I had to select and re-order things. All minor things, but just...frustrating. I am very frustrated right now, if you didn't get the message. I am trying to be happy with small victories and let the stress roll off with little things - like my successful readers' advisory today. Girl only wants to read Babymouse, mom only wants her to read chapter books on her level. Solution: Compromise with Dragonbreath and Bad Kitty and everyone is happy! Thursday - toilets plugged again. WHY?? I am now the official library toilet plunger. Can I put that on my resume? 49 people showed up to Lego Club, but we're also putting a sound system in the community room, so I jammed everybody into half the room. It was cozy, but nobody complained. I left after my program on Friday morning (with my director's permission). I went to Walmart for needed program supplies and then home to get the materials for the quilting program in August ready. It's not practical to lug all my cutting boards and ironing boards to work and I had to do the prep now so I could purchase and prepare whatever additional material was needed. Which I will do this weekend. and yes, i found the labels. typical. Sometimes simple is the best. It can be difficult to find really simple, basic easy readers. Apart from Mo Willems and Ethan Long, they tend to be bland, boring, or the vocabulary is way too advanced. I am getting more and more parents asking for really simple easy readers with just a few words per page (thank you 4k and your push to make all the kids read earlier) so I am looking even harder for level 1 easy readers that are truly easy. I was delighted when this showed up on my desk and I discovered that not only is it super easy, it's a subject kids will enjoy with attractive pictures. Each page has one to two short sentences that rhyme with the sentences on the facing page, "Rocks are big. They can't stay./Loader lifts them all away." 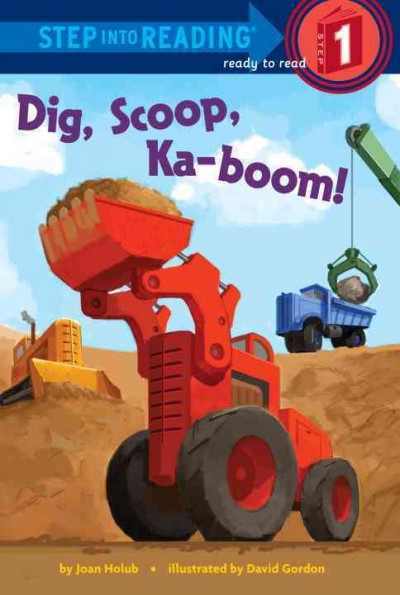 As you can tell from the cover, it's all about construction machines, with a different machine illustrated in bold colors on each spread. In the final pages, the reader sees the construction vehicles are actually toys being used by kids in a sandbox.One of the five children and one of the two parents have darker skin and two of the children are girls. The adults change (clothes and skin colors) in the next spread, so presumably there's more parents off-scene in the first picture, but it's a little confusing. Stickers are included in the paperback version I received for review, but I'm assuming they wouldn't be in the hardcover or library bound editions. Verdict: A good simple reader for kids who like machines and construction. Nice bold text and illustrations, simple vocabulary with some new words for the kids to try. An excellent addition to your easy reader collection. Buy it! Papercutz has brought another classic comic strip from Peyo (creator of Smurfs) to the US. Personally, I really enjoyed this story. I like the slapstick humor and old-fashioned design of French comics. However, I can't really see buying this for kids at my library. 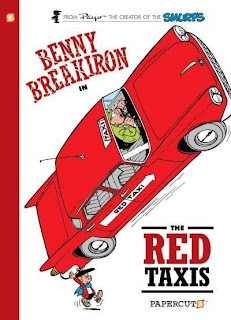 Benny Breakiron, a sort of French Dennis the Menace with superpowers, is having an average day and visiting his friend, Monsieur Dussiflard, the taxi driver. Then he discovers that a new fleet of red taxis, owned by Mister Hairynose, is putting Dussiflard out of business. Benny is suspicious and rightly so; it's not long before he and Dussiflard have been kidnapped, Mister Hairynose has gotten the police on his side, and Benny finds himself shipwrecked! Fortunately, his super strength (which disappeared earlier b/c he had a cold) comes to the rescue and he foils the plots of Mister Hairynose and the town is back to normal again. One of my main objections is how small the font size is. This didn't matter in the Smurfs, when kids would recognize the characters and pick up the comics, but with an unknown character like Benny, most kids flipping through the book will be put off by the tiny print and small size of the panels. Otherwise this is funny but it has a very classic look and feel to it that just won't work in my small-town library. Verdict: If your library has kids who are really into the classic French/Belgian comics - Tintin, Asterix, Smurfs, etc. they're probably going to be all over this. As I said, I personally really like these. However, they just won't be popular at my library where the kids are almost exclusively interested in more American offerings like Babymouse, Lego Ninjago, Lunch Lady, and classic superheroes. Papercutz' hardcovers are very affordable, so it won't break the budget too much to try out a volume if you're not sure how well they'd circulate. Sometimes it seems weird to be constantly encouraging kids to go outside. After all, I'm a library (well, not me personally, but you know) and I want kids to read, something that usually happens indoors. Also, it feels a bit hypocritical because while I do have a mini-garden and walk almost every day, I'm really not much of an outdoors person. However, to me libraries are more than books and when I say that I don't mean they're all about digital stuff. I mean that the library is a starting point for exploring the world, something I try to emphasize in as many of my programs as possible. What, exactly is the point of this long introduction? This book does an awesome job of piquing kids' interest in the outdoors and making what might sound like a boring hobby (bird-watching) something kids might try out a time or two. At only 50 pages long, this may look like a lengthy picture book, but every nook and cranny is packed full of information; including the endpapers! The endpapers have a humorous guide to bird-watching; what to take (including the right kind of friend) where not to go, how to sit and watch. 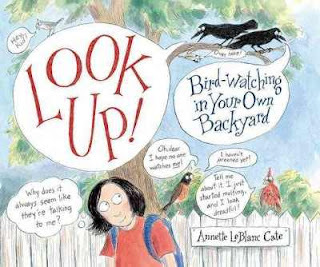 After introducing herself and explaining how she became interested in bird-watching, Cate jumps right in and talks about why, where, and how to look for birds in your own backyard, town, or city, record what you see, and especially identify different kinds of birds. She says right off that she's not an ornithologist, just an enthusiast, but the identification pictures of various birds are pretty clear, not to mention funny. There were a couple pictures, like the wheel of brown birds, that weren't labeled and in some places there is so much information packed in that it's a little overwhelming and confusing, but overall this is a fun book about a hobby most kids don't think about and are unlikely to have tried. Verdict: If you're looking for slightly unusual books to add to your hobbies and "stuff to do" section, this fits the bill. It's funny just to read on its own too, with lots of humorous comments from the birds and the author as well as facts about birds and their habitats. This week at the library; or, Breathing Space! Several years ago I decided not to have any programs during the July 4th week. This still catches people by surprise, but having that little breathing space in the summer is important. Besides, Pattie is gone because she goes by the school schedule and I can't possibly sub for all her programs! I was still at ALA on Monday, but lots of work awaited me on Tuesday. Even though we don't have programs it's busy, busy, busy, all week long! On Friday we had the Stuffed Animal Sleepover. It takes a couple hours to take all the photos - we had 42 animals this year (note that the photo album is linked to the program above, but it's not done - I'll edit it and add more photos on Monday) and our cataloger and I took about two hours to do all the pics, then our director developed and organized the pictures for the kids to take home. It feels like a picture-ish week. Have some pictures. Teen display put together by my aide. Only use we made of the CSLP art for teens this summer. My sort of currently reading shelves. The white shelves and the stack of picture books and the stack of comics. The regularly shelved books are just...books. I've been in a blah mood about the stacks of picture books I've been reading lately. Nothing wrong with them, just...bland. Nothing unique, nothing stand-out. Mini Grey is always unique and stand-out. Her stories don't always work exactly for my audience, but they're always different! A lot of them, like the Traction Man series, deal with toys and this one is the same. In this story, the toys awake to find that they have been left behind, outside, at night for the first time. At first, they're awed by the amazing night sky, but then they start to get scared and nervous and worried. Fortunately, WonderDoll knows just what to do; tell a story. 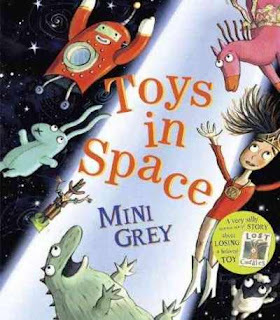 In her story, the toys are taken into space by aliens who turn out to be quite a bit like ordinary human children, especially since they're just looking for their own lost toys. The (suspiciously glove-like) alien treats them to a party, the toys help return all missing toys the world over, and they get back to their yard just in time. The illustrations are laid out with the space adventure overlaying the toys lying in the backyard, so children can clearly see which part of the story is "real" and which is the story the WonderDoll is telling. The toys have Mini Grey's inimitable style, with bulging eyes and stiff, frozen forms in the "real" world as they wait to be played with and exuberant movement in their imaginative world. Verdict: This may not be the best read-aloud, especially for a younger group, since it requires a certain amount of sophistication to catch on to the story and there's multiple speech bubbles in addition to the text, but older children will enjoy this latest addition to Grey's repertoire and if you have Toy Story fans they're sure to pick up the idea quickly and enjoy the clever storytelling. Make it on your calendars people, I have not only read, but loved a work of historical fiction. I don't do this often - as you can see, I don't even have a tag for this genre! It's 1949 and times are hard on the Nevada ranch where Ivy's parents work. Her best friend Annie has gone off to her annual (and expensive) summer camp in Maine and the fight they had before she left makes Ivy wonder if she has a best friend anymore. It's going to be a long summer with no one but troublemaker Billy Joe around. Then Ivy gets an idea to heal her friendship and her parents suggest a way she can make some money from her love of animals. Soon, she's caring for horses, training a dog for one of the ranch guests, and seeing a whole new future ahead. But when Billy Joe does something even more dangerous than usual and Annie returns for school, will Ivy ever have friends again? LaMarche's soft illustrations are the perfect touches to this gentle, hopeful story. 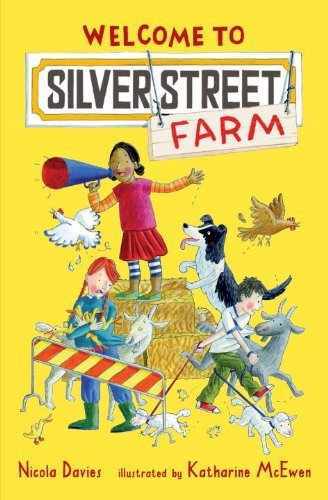 Ivy's struggles with friendship and her love of animals will resonate with a lot of kids, especially those living in rural areas where money is tight. I especially liked the way Wells lightly interweaves historical details (cost of things, dates, people only being able to get divorces in Nevada) into the story but keeps the focus on Ivy and her family. The story is firmly realistic; although there's drama with the animals (and Ivy's friends) there's no climactic finale when she gets all the money she needs and Annie comes back to be her friend. 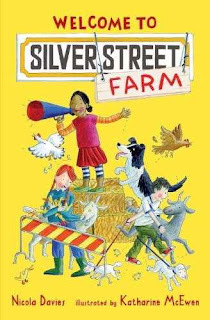 The gap between wealthy Annie and poor Ivy isn't simply washed away by their friendship for each other, but Ivy learns to cope with the changes in herself and her friends and find joy in her life and the animals she loves. Verdict: Kids who love animals and historical fiction will be big fans of this simple but heartfelt story. It's not a daunting length (only 200 pages) and I'd especially recommend it for kids who prefer working with animals and being outdoors to sitting down with a book; Ivy's practical approach to life and the realistic illustrations of animals and the accidents that befall them will make this a popular title. The sewing machine is mine, not a prize (-:) About half of these are books I purchased and about half are galleys. Usually I make a list of all the galleys I've brought back, but this year since I had the wonder of technology (i.e. borrowed netbook) and didn't pick up as many galleys b/c I was attending sessions (that's not a criticism or anything. I am neutral in the Great ARC Debate. I really don't care, although I have nothing against those who do) ANYWAYS. These are the books I saw/looked at/got galleys for and thought were interesting and possible purchases and was able to dump right into my ordering carts for later perusal. Not a complete list, just a sampling, no guarantee titles are full and correct, etc. It's just scribbled notes. I got some galleys that aren't on here too but like I said - just notes! I saw this at Papercutz and thought I'd missed one, but turns out I'd ordered it in January. Anyways, these are very popular with a lot of girls. Book King by Tim Lahaye? I swear I saw this at Tyndale publishers and it was some new fantasy series. Not to my taste, but I just had a parent ask for "Christian fantasy like Rick Riordan" so I wanted to look more closely at it. However, I must have taken the title down wrong and I've already deleted the picture and I can't find it anywhere! Will try to visit Tyndale House again. Free Spirit does a nice, varied collection of what I think of as "issues" books that we put in our parenting collection. We have quite a few kids with autism and other disabilities who use the library, something I've really been encouraging b/c we have the county's special education school. Anyways this looked quite practical and it was nice that it was from a kid's perspective. A reprint or a new series? Either way, it will do well. New series by Patterson. People will want it. Did i order this yet? Told the publisher we need more books like this series. I get that Lauren Myracle is a bigger name, but I'm a little annoyed that Ty had a big standout display and EllRay was crammed behind him. i dunno...kids seem to have lost interest in artemis fowl, but this does have a shiny cover. note look for reluctant assassin, warp just brings up uk version. independent publishing group that does gecko press recommended this and i can see the kids getting a big thrill out of yelling BANG every other page. before I am so handsome, there was another book! I did not know this! this caught my eye b/c the covers look like skulduggery pleasant. didn't have time to look very closely at them though. already ordered this i think? This is actually the first ALA where I really attended sessions. I had committee meetings at midwinter, but I was so stressed and couldn't figure out how the schedule worked, so I didn't really go to anything else. Anyways, bottom line: The stuff I went to was generally good and I enjoyed it, but I think people are right when they say that for actual "conference" stuff you should go to your state conference or ALSC Institute (which sounds awesome and I hope to go in 2014 if I have enough money). My personal preference for attending ALA for exhibits is Midwinter - Annual has too many authors! I know this sounds weird and contrary to what most people want, but I am really, really not a "celebrity author" fan and I want to talk to the publishers/publicists and look at the books that are forthcoming, not stand in line for a couple hours to get a scribbled signature on a book my library already owns. Annual is annoying in this respect (for me anyways) because the lines are in the way and the publicists won't talk to you, they're busy talking to the people in the signing line. I get that it's a money/marketing thing, but anyways Midwinter is my preference. I got up at 7, drank some fruit, and went to catch the shuttle a little before 8. This was NOT enough time, as I didn't get to the conference center until 8:45 and missed half of the program I was going to attend. This was when I discovered that ending times on the scheduler are totally arbitrary. It said it was ending at 10:30 and it ended at 9. Anyways, lots of good ideas - it was 20 ideas for under $20 or something like that. Then I wandered around until I found the Scholastic Book Buzz. These lists of "what I did" don't include all the walking! Everything was at opposite ends of the conference center and I don't know how often I traversed it, but it was A LOT. Why do publicists always sound like they're reading a script? Shouldn't they be able to booktalk freestyle? I guess it's unreasonable to expect them to booktalk their titles the way I do at schools, but I bet you I could get people more excited. Anyways, I am definitely buying their latest multi-platform series, Spirit Animals (fantasy, kind of a rip-off of His Dark Materials sounds like) and although I will groan about it, I will buy the next 39 Clues series. They've also got several historical fiction, graphic novels, and nonfiction about war which will be popular. Then I went (other end of the exhibit hall of course) to another program idea session, Take 10 for Tweens and Teens or something like that. It was extremely crowded but I managed to get a standing spot near the door and got some good ideas. I left half-way through because the next presenter was too quiet to hear, especially with people holding the door open and carrying on their own conversations in my ear. Exhibit hall, was very excited to touch Nathan Hale's latest, about the Donner Party and I got a galley of the two newest Beaver Brothers adventures and Tamora Pierce's Battle Magic! That last was totally a fluke - I almost never pick up teen galleys and I certainly never ask for the really hot items but I happened to be standing there when they were handing them out. If you are missing lunch in here, it's b/c I didn't have any. I had some peanuts and a couple cheese sticks in my bag. Next I went to Dynamic Duos: Building and Sustaining Public and School Library Connections. This was a little dry, but sparked a LOT of ideas for me, especially the first two presenters. The one from Stratford, CT talked about how they organized regular tours for all their 2nd and 6th grade classes and the other librarian talked about monthly visits to the high school during lunch time. The third speaker I kind of zoned out on, she was talking about educating librarians about collaboration and at the end got all choked up over her idea of every library having their own "Youth Literacy Consultant" I have still to convince my director to even consider a part-time teen librarian and I'm currently trying to get a part-time summer assistant for next year, so I kind of rolled my eyes on this. Anyways, I really enjoyed the first two speakers and have some new ideas for outreach. Then back to the exhibit hall, where I was excited to meet Anastasia Suen. We've "known" each other online in the blogging world and it was fun to connect in person. She has a beginning chapter cheerleader series that's cute, although I'm not adding anything new in this area at my library right now. I glimpsed James Preller from afar - I am really excited about his new Scary Stories series for young readers and will have a review up in October for my Read Scary series. I wanted to go to the Guerrilla Storytime, but first I couldn't figure out where it was, and then I discovered that the bag check (where I'd left my bag of books) and the departure gate (from whence my colleagues were leaving on a bus hopefully with my bag) were on opposite sides of the conference center, so I spent a while trudging to and fro. I did get to the program near the end and got to say hi to Melissa Depper and see some fun ideas, especially for music and movement. I then went to a book buzz for Houghton Mifflin Harcourt, whose publicists are a little more animated. I don't really see the point of promoting things like David Wiesner's Mr. Wuffles - everybody is going to buy it anyways, right? However, they had some other things that looked interesting, like a new Catherine Jinks title. And that was it. The lights went off, I dragged my weary self homewards via shuttle bus, getting back to the hotel around 6pm, and it was just me, the crackers and cheese, and my notes and photos to transcribe. I do not know how people have the energy to go out again in the evening! I drank some more fruit and left really, really early, determined not to be late. I got there 30 minutes early which was fine since I was going to the Calde-Tots program with my committee so we had time to chat. I wasn't sure if I'd actually enjoy this or not (see previous remarks about celebrity authors) but it turned out really good. I enjoyed listening to Eric Rohmann, Beth Krommes, and Chris Raschka (even if I'm not a huge fan of his art) and Megan Lambert from the Eric Carle Museum had many, many, AWESOME ideas. I have to keep reminding myself that my director said no more new programs (except my winter reading program and my Mad Scientists Club) because I had a great idea for an after school stories/art club. We'd forfeited our space in the all-committee meeting, so we then grabbed some chairs and had a committee meeting in the hallway. I'm sorry I could only be on the committee for a year because it was a really good experience and I actually enjoyed it (who knew committees could be fun?) but I just have two much work to do and not enough money to stay on. Anyways, what I got was good! I then went and had actual lunch with one of my committee members - we are the two small public librarians. I feel it forms a bond. Plus, we didn't have anything to attend until 1pm. This time, I managed to find the Preschool Discussion Group and it was great! Lots of great STEM ideas and I met a lot of people I only know online. Hmmm, definitely think I need STEM Storytime. I certainly have enough ideas...I had planned to go to another STEM presentation, but this was so interesting I stayed the whole time. Then back to the exhibit hall where I met SUSAN STOCKDALE. Ok, maybe I do like authors, I just don't like the big celebrity ones. Anyways, I got to tell her how we use her books over and over in storytime and I bought the board book versions to add to our collection. I also bought 2 more counting books from Alison Formento, who was wearing a very stylish fish hat. I was walking by another publisher and I was "is that..." and it WAS Cynthia Voigt and there was no line! I've been having trouble getting her older books to circulate, but I'm replacing them with the new covers and hope that will revive interest. Anyways, I bought a new copy of Solitary Blue for myself and got to talk to her for a few minutes about how much I loved it. Then I did a complete circuit of the exhibits hall. My director was here Saturday so if she wanted to add any new technology or anything (I think she was interested in a new self-check machine) I wanted to know what she was talking about, plus I like looking at the furniture, although the prices can be ridiculous. One place, I think it was Discover or something, had these kind of cool modular tables - train, lego, tinker toys, etc. and she casually tosses off that one table section starts at about $2,500. Eeek! My train table (plus train) cost about $200 and that was a stretch! Got back to my hotel around 6 and me, the apple and the cheese sticks settled in to process the day and pack to be ready to leave tomorrow. Then back to the hotel to pack up and check out, then down to the conference center where I checked all my bags. I had sort of planned to go to some stuff, but I was pretty conferenced-out by then, so I went to check that I could get to Ogilvie on the Metra from the conference center...and I couldn't. Arggh! Spent a lot of time wandering from information booth to information booth to figure out how I was getting myself and my bags back to the train station. Then I went to the exhibit hall. Publishers fall into two categories on the last day. Either they sell their books off at a discount or they let people into their booths a few at a time to pick free books. Unfortunately, they do not always advertise into which camp they are falling and people get confused. Generally, if there's a line (often starting at 10 or 11 for the giveaways at 12) the books will be free, if there's no line they are being sold. I refuse to stand in line forever for a couple free books, but I do highly recommend hitting the nonfiction publishers, especially Lerner and Abdo. You can get their books at a huge discount and if you're not paying shipping it's well worth it. I purchased a lot of books, picked up a few free books, and somehow accidentally got into a signing line for Steve Sheinkin, which was cool. I wanted the galley of his new book, but you had to buy a copy of his other title to get it and I gave in and bought a signed copy of Bomb to be a prize. I did stand in line at Capstone for about half an hour, but I was talking to a librarian from Wisconsin, so that was time well-spent. I went to one last session, Unprogramming for school-age audiences with Amy Koester and Marge Loch-Wouters which was good. Lots of ideas and Marge is always fun and inspiring to listen to. Personally, I've beat their unprogramming planning time of one hour - my after school clubs have to be set up in 30 minutes! Speed programming! I had intended to go to one last session on school/library collaboration to prevent summer slide, but they were telling everyone to sit at the tables and handing out pads and it was all too...school-ish. I just couldn't sit still any longer, so I took off. Collected my bags, repacked, waited for the shuttle, shuttle bus, taxi, metra, waited again (of course there was an accident blocking the small country road Sara the Librarian was coming on to get me), back to the library, picked up my car and finally got home at 9pm. Ignore all those blog posts about bringing sweaters because the conference center is sooo cold. It cannot be cold enough for me. I found grocery stories in Chicago, so next time I will know where to find food! I met everyone I wanted to meet, including old friends from school (all except for Meg Schmaus. Are you still out there Meg?) without going to any evening parties or bars. So THERE people who keep bugging me to be more "social" and gasping in horror that I don't go to anything after 6pm. Last week I reviewed Orca Footprints' book about children being involved in the food process, Down to earth: How kids help feed the world. This week I'm looking at the other title so far in this series, about bicycles. The book opens with a history of bicycles, including facts on how they changed history, especially the lives of women. 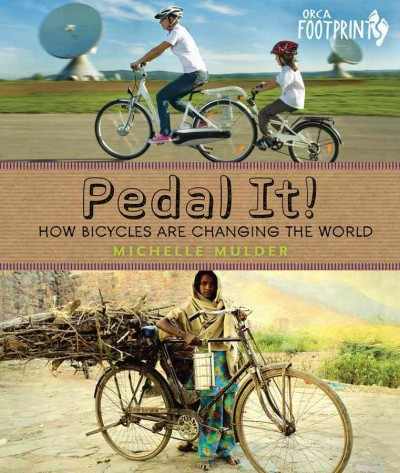 The second chapter explains how modern bicycles work, gives a brief tutorial on learning to ride a bike, and talks a little about some of the new things bikes are doing, like being made out of bamboo or being used to harness electricity. The third chapter talks about some of the ways bicycles are used, from fun tournaments to everyday life. "Pedaling for change" the final chapter, explains how bicycles are changing the world today, offering people new opportunities and helping the environment. Interspersed throughout the chapters are photographs of bicycles in action, personal anecdotes from the author's own life, and historical details and modern facts about bicycles. The back matter includes books, a movie and websites, acknowledgements and an index. I appreciated that while the book didn't really address people who can't practically switch to a car-free, bicycle-centric life, it also didn't rant and rave about them. Bicycles are great, but it's not practical for, say, people living in Wisconsin to bike 11 miles to work in several feet of snow (or 11 miles to work any day, on a highway, for that matter. I'd have to be in serious physical condition to attempt that feat. I'm not) However, there is lots of practical advice for kids wanting to bike more often and parents wanting to make their lives a little more healthy and less car-dependent. The history sections were interesting and not too lengthy and kids will especially like the many photos and information on the ways bicycles are used around the world. Verdict: This might be a little more popular in an urban environment, but there are quite a few kids who ride bikes in our area and even a few parents, so I think it's worth purchasing in any library, just for the look at how bicycles are used around the world.